If you love the look of long dark lashes, then look no further. With this step-by-step guide—and a little help on product selection—you'll get gorgeous lashes every time! Here's how to do it. It's OK to admit it: You have eyelash envy. Why does everyone who doesn't want or appreciate long lashes have them? There's the teenager with impossibly long eyelashes across the street, the giraffe at the zoo, your boyfriend's baby pictures. It happens. But there's no need to rush to the nearest lash extension salon or stock up on Latisse just yet. There are plenty of techniques you can try to bust out killer lashes—no procedures required. 1. 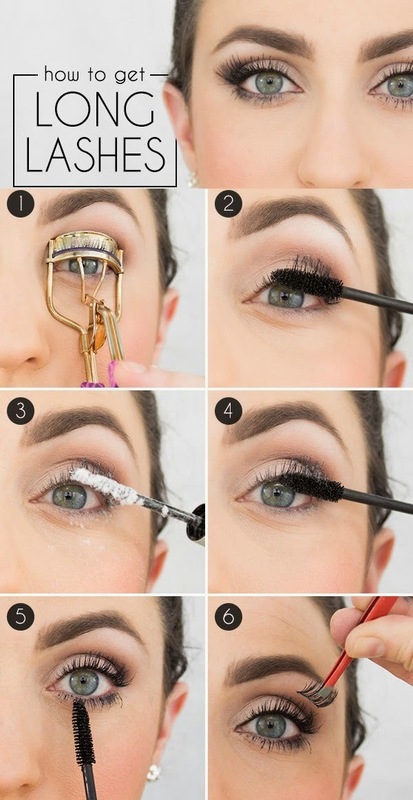 Curl your lashes. If you want long eyelashes, you can't skip this step! Curling your lashes flips them upward, maximizing their full length. It's like opening the window shades. Tarte's Picture Perfect Eyelash Curler is foolproof. 2. Apply a waterproof mascara. Waterproof formulas hold curl best. I like L'Oreal Voluminous Waterproof. 3. Apply lash fibers to your lashes before the mascara dries. These will attach to your lashes, thickening and lengthening at the same time. I am using Japonesque Fast Lash Thickening Fibers. 4. Immediately apply another coat of mascara. This will seal in the fibers and conceal their white color. 5. Apply mascara to your bottom lashes. Don't skip them if you want your lashes to look well-rounded and lush. Tight-line the inner rim of your upper lid with a black eyeliner pencil. This will thicken the base of the lashes, making them appear just that much longer. 6. I don't always like to wear a full strip of lashes, though you certainly can, but I find a half lash is infinitely more comfortable and gives an elongated shape to my round eyes. Half lashes are much easier to apply too! If you feel uncomfortable with the lash fibers, try a mascara with the fibers already incorporated. I love L'Oreal Voluminous False Fiber Lashes. Try layering two different mascaras, a more lengthening one and a more volumizing one. Apply the lengthening one first. Skip a thick line of eyeliner. You'll see the full length of your lash, base to tip, without a thick line cutting your lashes in half.